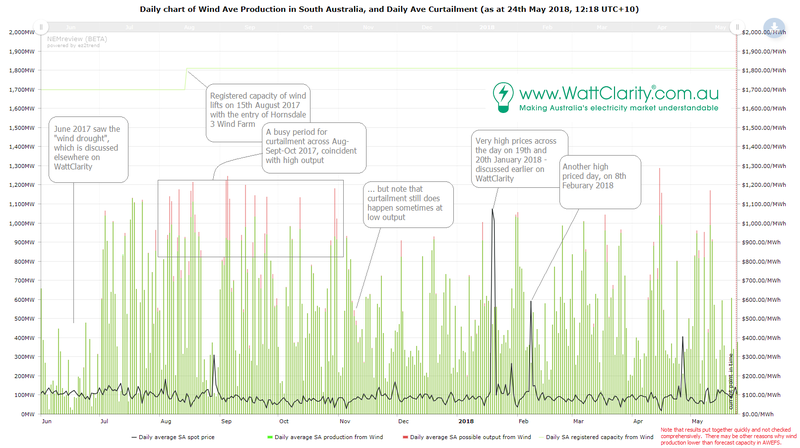 Just how badly is wind energy curtailed in South Australia? South Australia shows surprisingly little curtailment of wind energy, even though its output can reach 120% of demand at times. For all the hand-wringing in certain sections of the media and politics about the levels of wind power in South Australia’s grid, it seems that the integration has been remarkably efficient, at least on one key measure. New figures from the Australian Energy Market Operator show that the level of “curtailment” of wind energy is remarkably low, an achievement that is even more remarkable because of the high levels of wind energy sometimes experienced in the state. Our interest in this was piqued by a report from Tilt Renewables earlier this month, which indicated that 2.4 per cent of output from the 370MW Snowtown wind farm, the state’s biggest, had been curtailed since new measures were introduced by AEMO last July. Broadly, these measures require a certain number of gas or diesel generators to be running depending on the level of wind output. If not enough generators can be found, then the output is clipped, or curtailed, and wind farms instructed to lower their output. The Snowtown estimate roughly equates to the level reported by AGL, which owns the Hallett and Wattle Point wind farms in the state. And the new data from AEMO confirms this. It says that around 1.2 per cent of wind generation was curtailed during the first three months of this year, down from 2.3 per cent in the December quarter and 5.9 per cent in the September quarter. The steady decline may have something to do with the fact that AEMO has produced an increasing number of possible combinations of synchronous units that can be used, meaning it is easier to round up sufficient system strength. As we reported earlier this week, those combinations were tested dramatically when the state’s biggest gas units, at Pelican Point, went out of action for unexplained reasons. The absence of those units over the past month has required older and more expensive generators to operate, and a big increase in “directions” to those generators, although it is not yet clear whether this has resulted in more curtailment for wind. Just to put the level of curtailment into context, a recent report in Science Direct found that 4.4 per cent of German and 5.6 per cent of British wind power was curtailed in 2016. The report found that result was pretty good, but the share of wind in Germany and the UK is much lower than in South Australia, where wind accounts for around 42 per cent of local generation, and can produce 120 per cent of local demand. Curtailment in other countries can be significantly higher. A Brookings Institute report showed that curtailment in China averaged between 10 and 16 per cent of output from 2010 and 2016, when the share of wind in total generation was just 6 per cent. This article in Renewable Energy World suggested it was still running at 15 per cent in early 2017, and in some provinces it had run as high as 43 per cent. This is the result of chaotic grid planning. This article gives another interesting insight into the problems in China. In a different study, America’s National Renewable Energy Laboratory predicted that without sufficient grid planning, wind energy curtailment in the US could reach 15 per cent, even if its share of generation was 35 per cent. In Ireland, where the share of wind energy was 21 per cent in 2016, the level of curtailment was 2.9 per cent, according to that country’s network operator. Which suggests that South Australia is doing pretty well, with more than 1,800MW of capacity installed in a grid that sometimes falls to minimum demand of around 500MW. ElectraNet says the AEMO directions cold be eliminated by 2020 if it could add three new “synchronous condensers” to the grid to ensure system strength, which would also lower costs to the consumer. But, with another 400MW of wind under construction, and a heap of large-scale solar PV, and yet more rooftop solar investment, curtailment could emerge again as a big issue without either significant amounts of storage, or more links to NSW or Victoria. Victoria, which aims for a 40 per cent renewable energy share by 2025, itself is likely to face issues because of inadequate grid infrastructure. AEMO has already warned, as we reported here, that new and existing wind and solar farms face significant curtailment without further investment in poles and wires, or storage. How efficient are synchronous condensers compared to batteries? The condensers dissipate excess power as heat, while inverters with batteries can store excess power to be recovered later. Is that too simplistic a view? Batteries provide better support than inertial systems, since they aren’t constrained by inertia and don’t lose power as they deliver more energy. The more energy an inertia based system delivers, the lower its speed becomes which means it shifts out of frequency. The battery system can deliver peak power at exactly the right frequency all the way to the end of its energy reserve. They are being proven wrong on a daily basis. Synchronous solutions are hobbled by inertia and limited kinetic energy reserve. They are complementary as neither can provide all the required grid services. Synchronous condensers are essentially flywheels that provide services like inertia, fault current, voltage control. Batteries can rapidly absorb/inject power, provide frequency control, reactive power, etc. If curtailment were to increase to any great degree I imagine storage comes further into play. There’s a lot of development happening in Western Victoria, meaning that VIC’s issues will be SA’s issues, and vice versa. There’s some work to be done. It’s a problem only on Vic’s 220 kV network. Those wind developers who pay the extra to connect to the 500 kV network (such as the Stockyard Hill Wind Farm) won’t have a problem. Hi Paul, Did you add in non-scheduled wind? The totals should reach up to 1600 MW, and heavy curtailment shouldn’t kick in at 900 MW. Seems like there’s 300 MW missing. Are you using UIGF to estimate the losses? The charts show daily averages, so that might explain. But, as noted on the chart and in the article, no time to comprehensively check today, unfortunately. SA wind generation is now restricted to 1300MW, Murraylink was out of service for an extended period in Q1/2 18 limiting export. Instead of curtailment, could the excess capacity be directed to block chain services behind the grid? Pumped hydro is a good option to avoid such curtailment. The nice thing about pumped hydro is that when pumping it can provide reactive power management and voltage control, so as well as providing some work to do for the otherwise excess wind it can contribute to system strength. And at other times when not pumping or generating it can offer synchronous condenser services.